Having just started my third year of uni, I have quite a bit of experience now at train ticket buying! I have a few easy tips and tricks which I would like to share to help you save as much money as possible. Lots of us have started back at work/college/university after the summer break. Last week I saw a article from the Manchester Evening News which you can read here about Virgin Trains no longer allowing people to use their rail cards to buy off peak tickets for on peak train times. This was a massive shock to me as I often travel on peak but even though the tickets are more expensive at full price, I have always been about to use my 16-25 railcard to save 1/3 on all tickets. For university I have to travel to Lancaster for some of my lectures last year this would cost £14 for a return using my railcard, this year it's £23. On this particular journey Virgin have been rather cheeky and put the full price ticket up. They are allowing you to use your railcard but to buy an on peak ticket rather than getting it at an off peak price. The ticket is now £9 more, so they have still made the profit which they have intended to. I think all the tickets have been put up even if it's just £2/£3. They are very nifty those people in Virgin HQ, as they know people will still pay it as they have to go to work or home. Being at university in Carlisle a return ticket from Bolton - Carlisle without a railcard is £49! Which I think is absolutely ridiculous for a journey with takes under 2 hours. With my railcard this same ticket would cost £32.35. This is a hefty saving but to me it is still a rather large amount of money. Over the summer I quit my part time job which I have had since I was 17, as it was just not working having being on placements and also my summer holidays. But I have managed to pick up a bank job which is perfect as I can pick and choose when I want to work, with no ties into working every week. So I have decided that I am going to be coming home a lot more this years due to personal matters, but I have thought about the additional cost which this is going to cost. I did buy my first ever car over the summer - finally after passing my test two years ago. But I am having a few teething problems and I'm not quite ready to be whizzing up and down the motorway all the way. I would also be travelling in rush hour, and come the dark winter nights there are no lights on a main part of the motorway which I would be traveling on. So for now I'm sticking with trains until I build my confidence up to face the motorway journeys. So how do I save money in my tickets? My best tip is booking your journey in advance if possible, it can save major pennies. I no this isn't always the case, as you might need to get to somewhere spontaneously, but if possible if you look two/threes weeks or in further in advance you can save a good sum of money. I can get tickets as cheap as £6.75 for a single ticket meaning for a return that's over half of the original sum. I have to say this doesn't happen that often but for me if I book three weeks in advance tickets are available for £8.20, nearer the time the price is usually £12.20. Over time if you are travelling regularly you will notice a big saving, for not that much work. The closer you get to the date you are travelling the more it will be, as they set a limited amount of 'cheaper' tickets available on each train journey. They are first come first serve, so literally when they are gone, they are gone! I have only ever paid the full amount of money on 2/3 occasions, and that has been when I decided the night before that I want to venture home for the weekend. What is madness is you will notice that train tickets are practically the same amount for singles as open returns - how crazy! A single from Bolton to Carlisle is £31.00 and a return is £32.35. So bare this is mind as if you get an open return you can use the return part for an entire month. I have had many train journeys where my ticket has not been checked, meaning that I have been able to reuse it within the month. I must state I actually like getting my ticket checked as it makes me feel like it was money well spent, whereas when you don't I get that feeling of I really shouldn't of bothered. What really annoys me is that there is always a cheap train at 15.49 for me to get home, as its just before the start of on peak and rush hour is about to start. However I finish uni at 4 which is so annoying! But if you are able to travel during the day, you can save a good sum of money. Take this into consideration if your going on a day trip if you travel between 10-3 and then after 6 you'll notice you can get some bargains. Another tip is splitting up your train journey. For me, 9/10 times I have to change in Preston. So when browsing for tickets if there is no cheap direct journey, consider splitting your journey up. If the journey planner is telling you that you have to change somewhere anyway, then that's the perfect place to do it at. So I browse for tickets from Carlisle to Preston and then from Preston to Bolton. As the part of the journey from Carlisle to Preston is definitely the most expensive. For example once again booking in advance, I can get both parts of the journey for £12.50 so £25 a saving of £7 just for splitting up the journey. Finally, the train line app is an absolute god send as you can quickly browse and book tickets. On the app they charge 0.50 for a booking fee for paying on any card, which is cheeky once again as you obviously can't pay cash. So if you live near the train station you can book them at the ticket office and not pay the booking fee. But that's a lot of effort if you don't live near the station, so what I do if possible is to bulk buy. As if you doing four journeys within a week and book them separate that's £2 extra. Also, the most convenient way to collect your tickets is by collecting them at the self service ticket machine. You can collect them within an hour of buying them from any self service machine across the UK. If I've booked a few different journeys you can collect them in bulk. 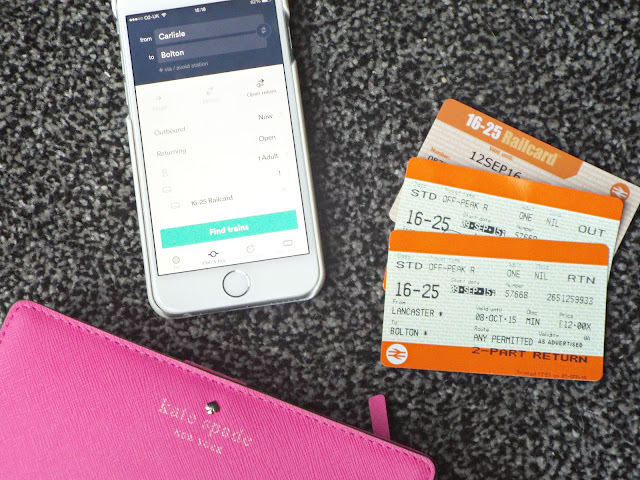 You can check your tickets on the my tickets section of the app as it tells everything you need to know about your journey. I hope this has helped you as before I went to university I was clueless as to where to start and simply didn't go home that often as I thought that I couldn't afford to! Have got any other tips for train users?